For centuries terracotta has been used for flooring (fired earth) to literally give a warm floor under foot and visually exudes a cosy ambience. Colours vary from sumptious rich oranges, reds and browns to more mellow honey tones. Terracotta is a ceramic material that has been used for building construction and decorative arts since ancient times in cultures around the world. Terracotta, which literally means “baked earth,” is made from natural clay, which gives it a characteristic reddish-brown color. The color varies slightly depending on the clay used. Terracotta may be glazed for extra durability or to provide color. It is a waterproof and very sturdy material, and many ancient terracotta sculptures are still in excellent shape. The beautiful mellow shades add to the warmth and character of any theme, age or time. 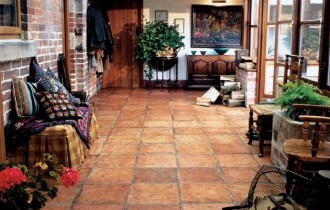 Whatever the mood is, there is a special style of terracotta floor tile that compliments it. The designs are such, rather the material is such that it can be molded to any period of time, and be it ancient, medieval or the modern society.